Usually, my puzzle table features a math-y puzzle of sorts. This week is different. I've chosen a word/letter-based puzzle from Puzzle Box, Volume 2 (affiliate link). 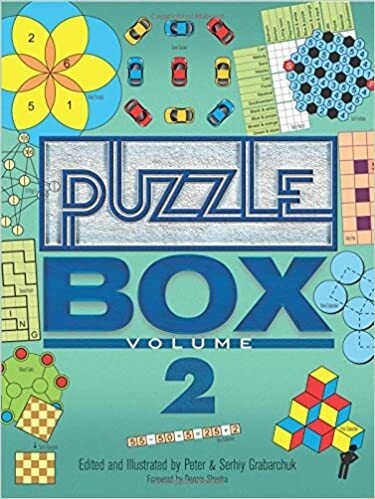 I've posted plenty of puzzles on my blog from Volume 1 and Volume 3, so I decided it was finally time to show Volume 2 some love! Don't worry, there is still some mathematical reasoning hid in this puzzle! You are given nine cards. Each card features a different set of double letters. 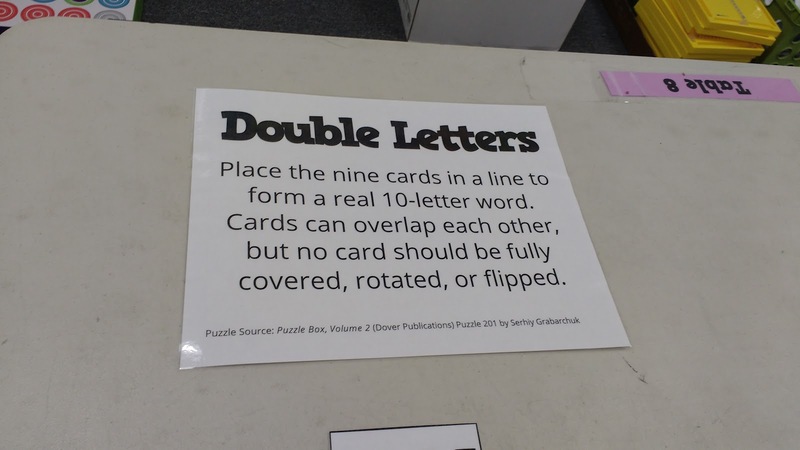 Your goal is to arrange the nine cards in a line so that a 10-letter word is formed. Card can (and must) overlap each other. But, you cannot fully cover, rotate, or flip any of the cards. 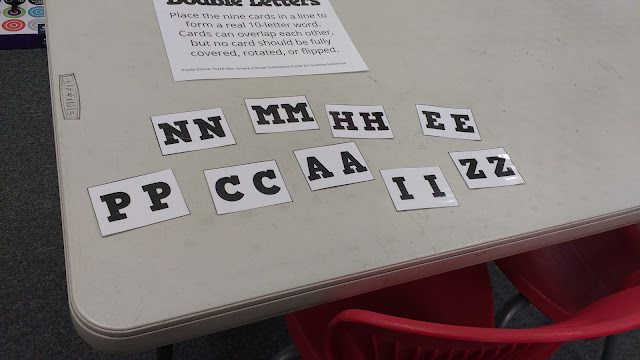 Here's an example of how the letters should be arranged. Keep in mind, the word you will be creating is MUCH longer! If you figure out this puzzle, please don't post any spoilers! I've uploaded the file I created for my puzzle table here. Happy Monday! After only having school three days last week thanks to President's Day and an Ice Day, it's going to be tough going for an entire week! 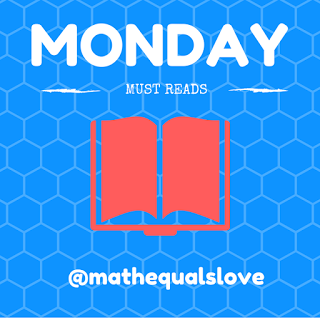 Hopefully this volume of Monday Must Reads will provide you with some inspiration to get through this week of school! 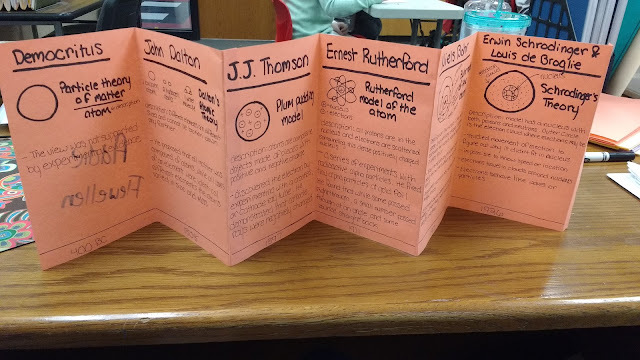 Mr. Knowles shares an awesome activity that helps students make connections between equations written in words, equations written in symbols, and the solutions of both types of equations. I also really like this starter activity for sequences that Mr. Knowles shared. Kim Spek spotted an awesome math-related comic this week. I learned a new vocabulary word this week thanks to the UK Mathematics Trust. Have you ever heard of the primorial of a number before? Kerri Sustich puts a fun twist on 2 Truths and a Lie with 3 Truths and a Lie to practice substituting values to test for solutions. 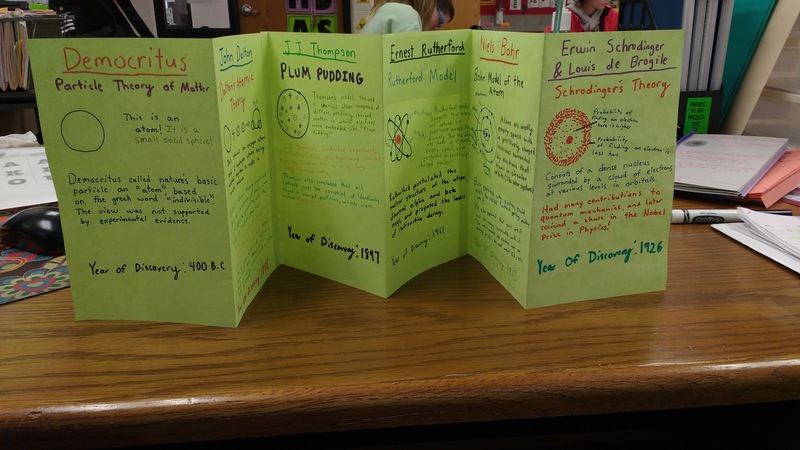 Also from Kerri, check out this text-message based task. ADHS Math shares an interesting task that gets students comparing Coke and Pepsi. Do your students need practice creating nets? Check out this net-building challenge from Jacqueline Tisher. I love that students were given only 30 seconds to take their measurements before beginning to build their nets. Chris Smith's Puzzle of the Week is a present to geometry teachers. The problem was adapted from UK Mathematics Trust. Erin-Rose Schneider posted a photo of something called the Game of Nines that caught my eye on twitter earlier this week. Here are the rules: Write out the digits 1-9 on sticky notes. Make two rows of 3 digit numbers that add up to the 3 digit number in the third row. Paul Jorgens is at it again. This time, he lost the constant from his quadratic. I loved seeing how his students tackled this problem. I look forward to spending time this summer creating my own problems and then losing parts of them! Paul also has me rethinking my systems unit with this task from Marilyn Burns involving grandmas, acrobats, and a dog named Ivan. Solenne Abaziou shares a famous puzzle that needs to make an appearance on my puzzle table! Mrs. Reams shares some awesome open-middle style problems that she created to help students practice and show their mastery of slope. Julie Morgan poses a creative factoring challenge. Students not only have to factor each polynomial, but they have to classify it according to what must be done to factorize it. Chrissy Newell has been posting some awesome elementary math tasks on her twitter feed involving "Medal Math." Jae Ess is inspiring me to make my solving equations unit a bit more exciting with a maze as practice. Too often, I fall into the classroom trap of everyone does the same thing. I like this "Choose Your Own Exponent Adventure" from Liz Mastalio. David Wees shares an interesting puzzle from Joan Countryman. Also from David, an inspiring vocabulary practice activity. Inspiring Maths shares an interesting spider puzzle for practicing substitution and evaluation. Amanda Atkinson inspires with her approach to asking more open-ended questions. I never enjoyed teaching inverses when I was teaching Algebra 2. Luke Walsh's approach to inverses, on the other hand, is fresh and exciting. Laura Wheeler shares an interesting task known as the "Tax Collector." 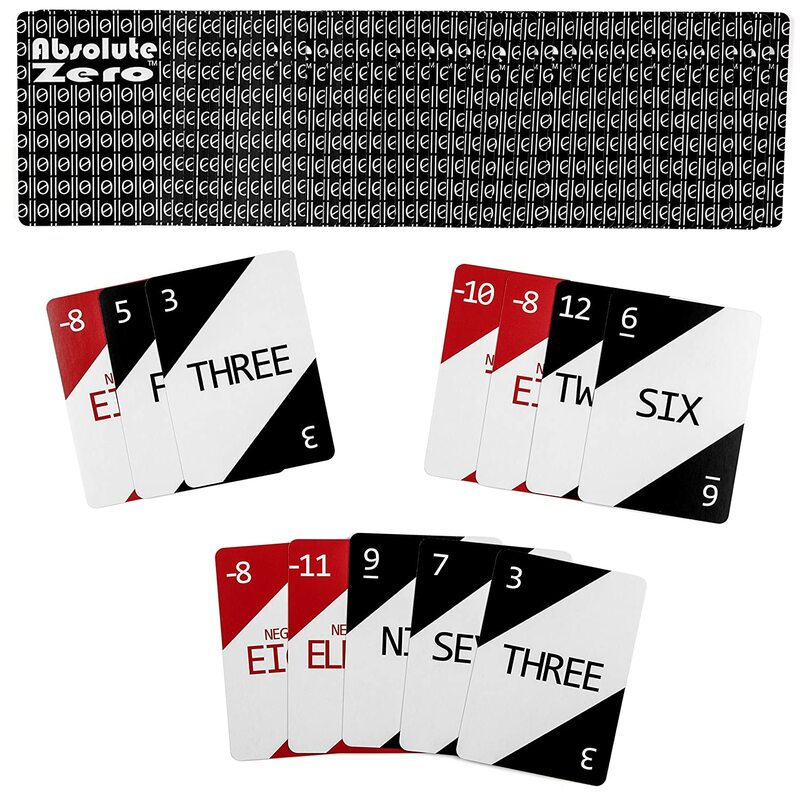 A few weeks ago, I was contacted by Elizabeth Mays, the creator of the Absolute Zero Card Game (affiliate link) to ask if I would be willing to review the game on my blog. If you've been around my blog much at all, you know that I love math games and puzzles, so I jumped at the opportunity. 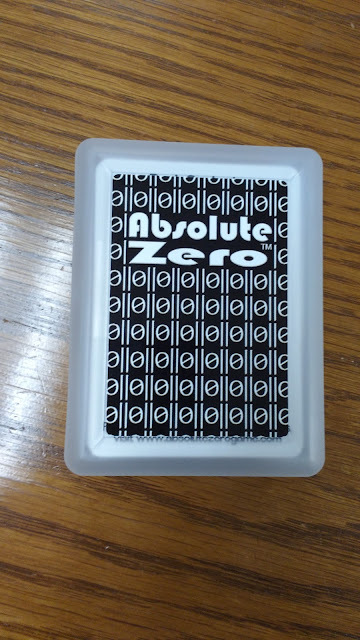 A few days later, the package containing my Absolute Zero game (affiliate link) arrived. Inside, I found a small plastic case that was just slightly larger than a standard deck of cards. The back of the case gives details about the goal of the game: "The first one with nothing wins!" 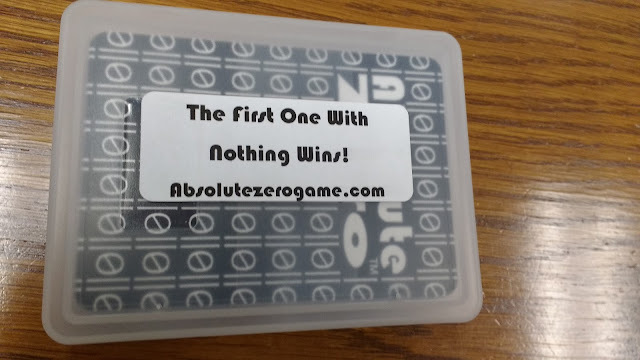 You can also check out absolutezerogame.com for more details. 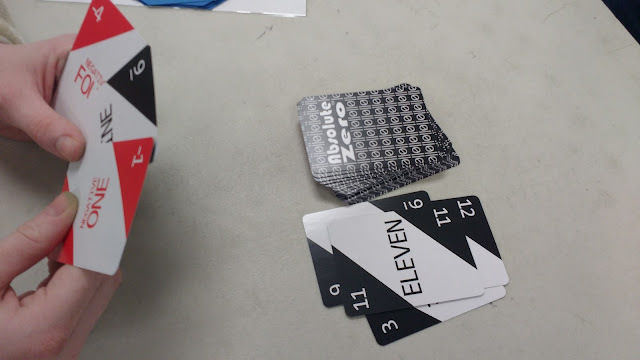 The first few cards in the deck share information on the deck's contents and the rule cards for the game. As a math teacher, I love that the same deck of cards can be used to play several different games! The cards in the deck are color-coded according to their sign. 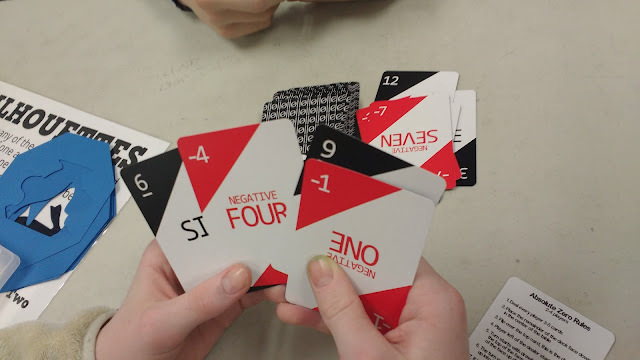 All of the positive cards are black, and all of the negative cards are red. It felt almost shameful to shuffle these nicely organized cards! As I mentioned before, this deck of cards can be used to play several different games. The Absolute Zero Game is appropriate for middle school through high school. 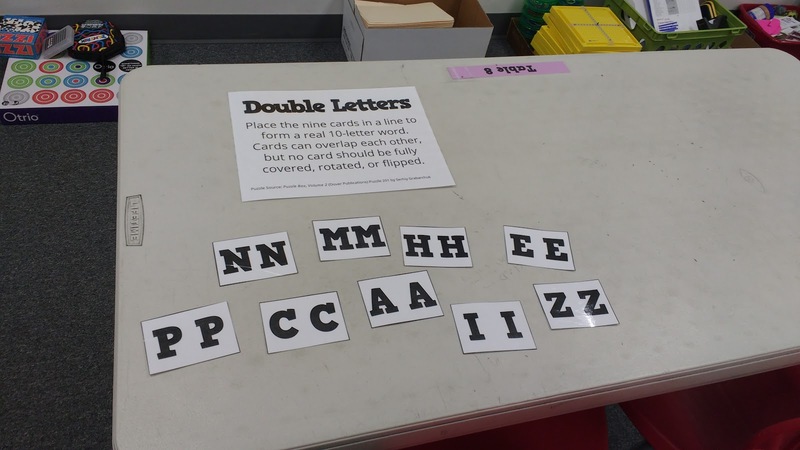 It could also be used in upper elementary classrooms if the students are already comfortable working with negative numbers. The other versions of the game (Addition War, Multiplication War, and What's the Difference?) are more appropriate for elementary classrooms. Bonus: If you buy this game for your own kids, it can grow with them! 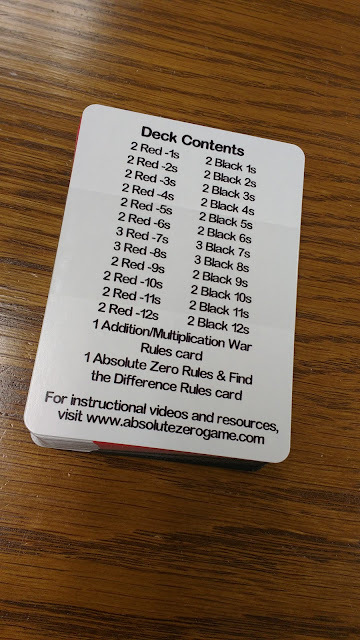 There are K-5 versions provided in the instructions that only use the black cards. As your child learns about negative numbers, you can start to play more advanced versions of the game. Let's take a look at the rules for this game. There are several things about the rules of this game that I love. 1. The game can be played with anywhere from 2 to 4 players. So many math games that are out there require an exact number of players. 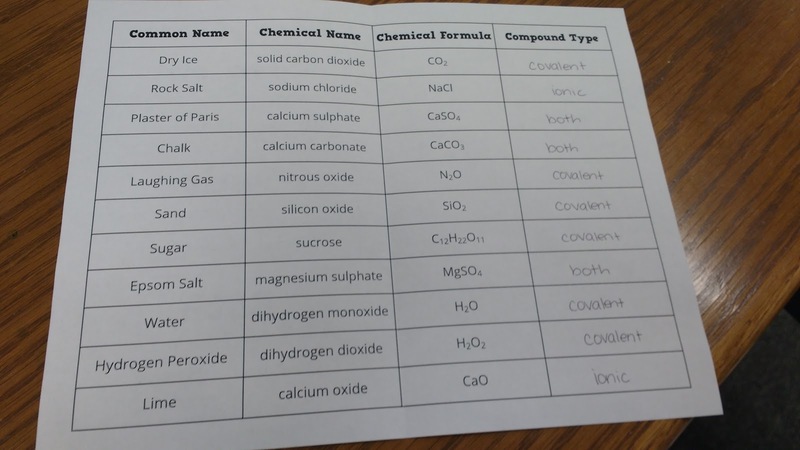 This can be tricky to implement in the classroom. I've had to stop what I was doing to play a game with a student because the game could only be played in pairs when we had an odd number of students in class. Yes, I enjoyed my time playing the game with the student, but it's not always ideal. 2. The game has built-in levels of difficulty. For the easiest level of the game, each player is dealt 3 cards. To increase the difficulty, increase the number of cards to 4 or 5. 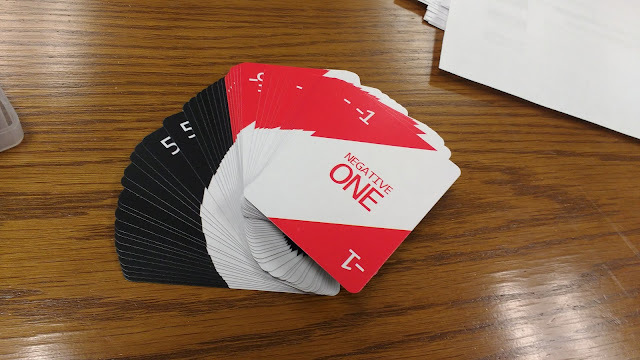 If you have multiple groups of students playing this game, you can easily differentiate between groups by having some groups deal three cards and other groups deal four or five cards. The only important thing to keep in mind is that each player in the group should be dealt the same number of cards. 3. The game is designed by a math teacher, and it shows. I love how game play encourages different strategies. When my husband and I played the game (we are both math teachers), we found ourselves going about reaching an absolute value of zero in completely different ways. Our conversation naturally turned to math as we discussed these varying strategies. 4. The actual rules of game play are simple. I can't tell you how many games I've bought with the intention of using with my students that sit in the cabinet and collect dust because the rules are just SO complicated. Deal each player 3, 4, or 5 cards depending on your selected difficulty level. Place the remaining cards face down in the center. Flip over the top card to create a discard pile. On your turn, you can either draw a card from the deck and discard a card from your hand OR pick up the top card from the discard pile and discard a card from your hand. At the end of your turn, you should have the same number of cards you were dealt at the beginning. 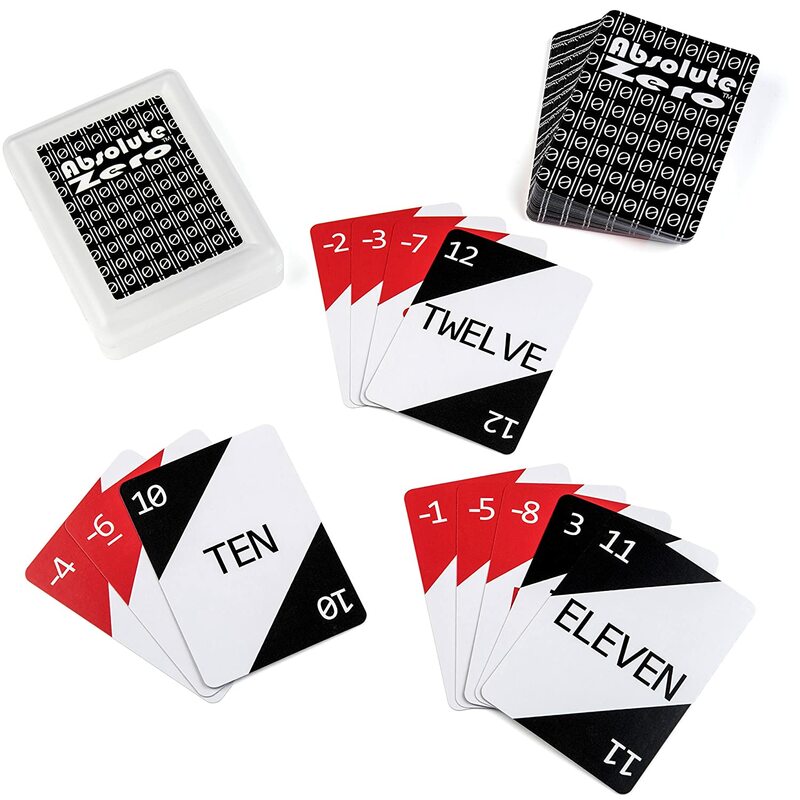 Play continues in a circle until the numbers on the cards in one player's hand add up to zero. Still confused about the directions? You can watch a quick 1 minute video that shows one round of the game being played here. 5. The rounds are relatively quick. The game moves so fast that your turn has come around again before you know it. There's no time to get bored with this game! There are special rules for scoring, but I will be honest with you and say that I have ignored them when teaching students how to play this game. If I was going to spend a large chunk of class playing this game with my students, I would introduce the scoring rules and use the free printable score sheet provided online. If I was just going to use this game as a station or early-finisher activity, I would probably ignore the scoring rules altogether. When my husband and I played a few rounds, we did play with the absolute value scoring rule. Knowing that I would be greatly penalized if I lost with a bunch of positive cards or a bunch of negative cards definitely changed my strategy. There were several rounds where I ended up being dealt three negative cards. I found myself trading for the cards in the discard pile just because they were positive and would bring my score down in case my husband ended up beating me to absolute zero first. You can watch a 2 minute video about how scoring works here. 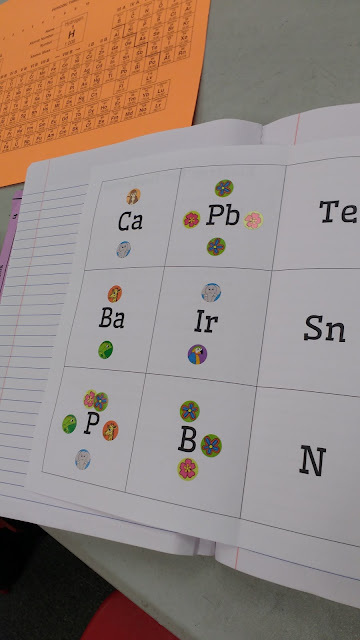 I used this game as an early-finisher activity for some of my classes who were ahead of my other classes. 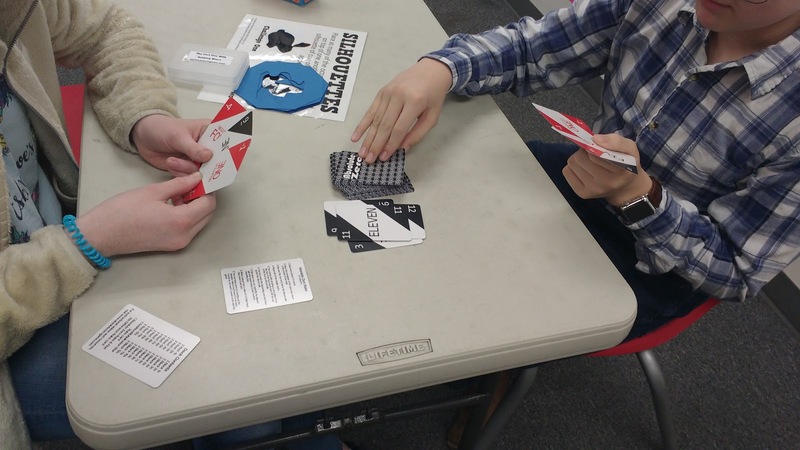 My students really struggled with reading the directions for themselves to get started with the game, so I ended up giving them a quick tutorial of how the game worked before they got started. I do not believe this is a fault of the game's written instructions but of my students' direction following abilities. I find that I have to do this with EVERY SINGLE GAME. As a kid, my sister and I spent many a Saturday afternoon deciphering the instructions of a new board game that we had purchased at a garage sale that morning. Many of my students have never had to read game directions for themselves. They are much more familiar with computer and mobile-based games where you are walked through the directions in a tutorial level. My husband and I were able to quickly teach ourselves how to play the game based only on the written directions on the card. If you think your students will struggle, you might show them the instruction video linked to above before allowing them to start playing! Here are a few action shots I took while some of my students were playing. I told one group of students that I had received this game in the mail, and I was supposed to see what my students thought of it so I could report their thoughts back to the creator. 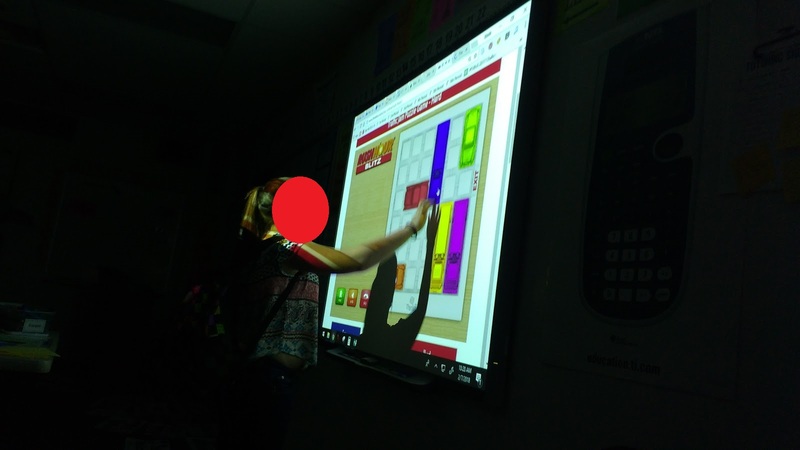 One student piped up, "You can tell the creator that it's an okay game for a MATH game." This was not the glowing recommendation from my student that I had hoped for. Luckily, the story didn't end there. The next day, we had a few minutes left at the end of class, and I once again let my students who were finished with everything pick up a game off of the table to play. This same student who had described it as just an "okay game" decided that she was going to play Absolute Zero for the second day in a row. A few days later, I overheard this student once again talking to another student. They were comparing the games in the pile and discussing which one was their favorite. One student boasted that Otrio was the best game in the pile. 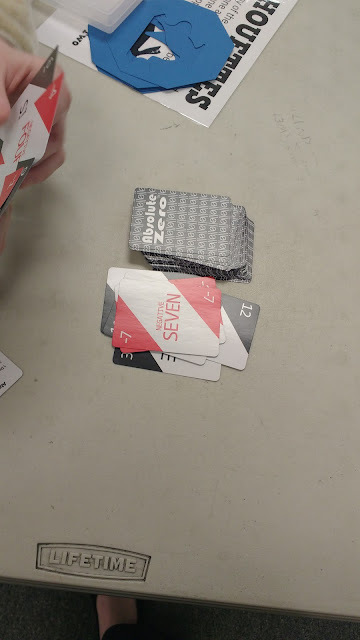 The other student, however, began to try to explain why the Absolute Zero game was the most fun game in the pile. She even broke into a quick explanation of the rules. So, there you have it: this game is both math teacher and student approved! The game is well designed. Game play is smooth. The mathematical elements of the game are spot-on without seeming too math-focused. My only complaint lies in the plastic carrying case that the game comes in. After being opened and closed several times by students, the box no longer stays shut. This isn't a huge problem. A quick rubber band around the box will fix the issue. Want this game for your classroom? You can pick up a copy (or two or three!) at Amazon (affiliate link). 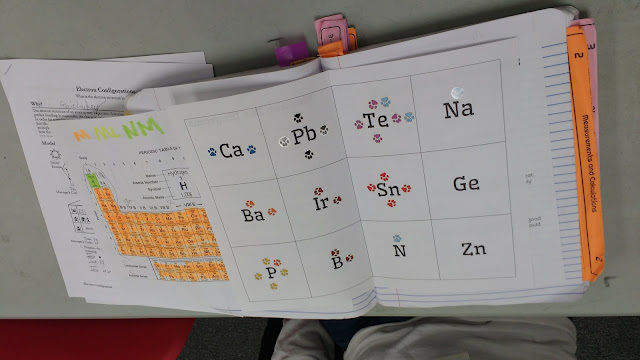 It's Friday once again which means it's time to compile another post with some of the smaller goings-on in my classroom that deserve to be compiled and shared. 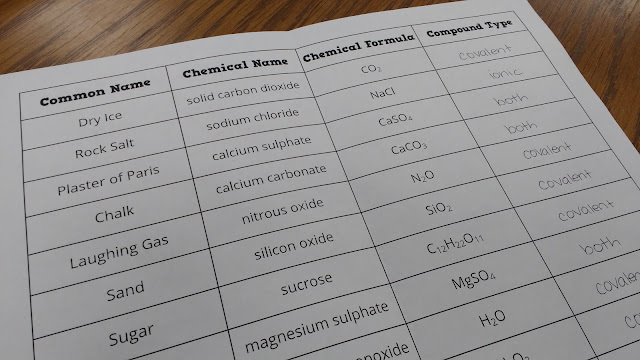 I didn't plan it this way, but 4/5 of this post has to do with my chemistry class. 1. 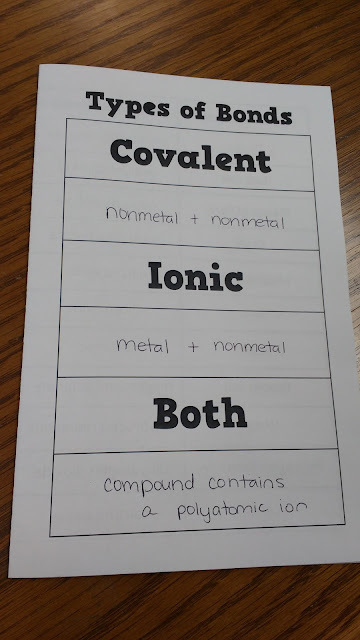 In Chemistry, we're currently practicing classifying compounds as covalent, ionic, or both. 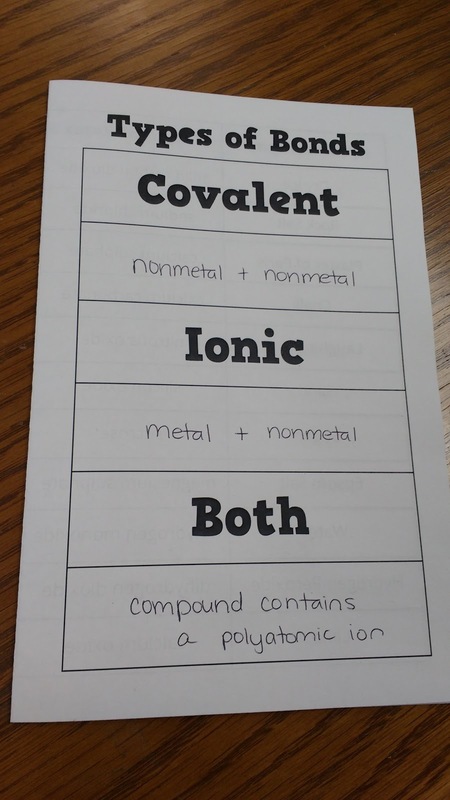 Yesterday, we practiced this skill by classifying common, everyday compounds. 2. 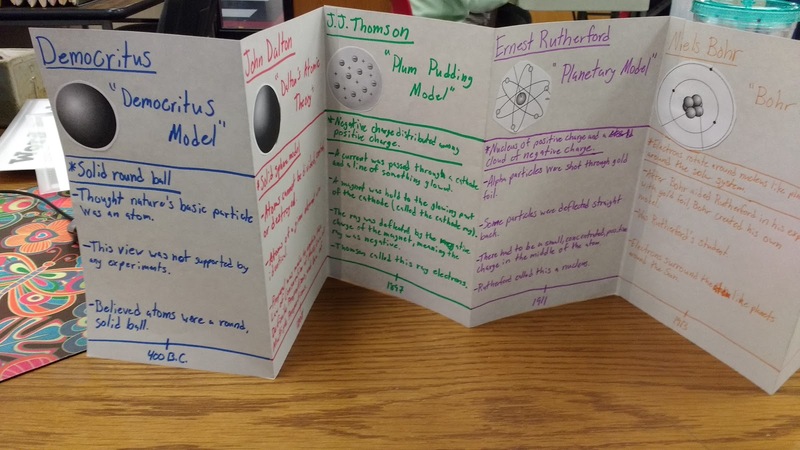 I'm super pleased with how my students' atomic theory timeline projects turned out. We didn't have time to cover every theory in class, so this project helped round-out our understanding of atomic theory. My kids complain about how easy it is for me to draw dots on the SMARTBoard and how time consuming it is to draw their own dots. 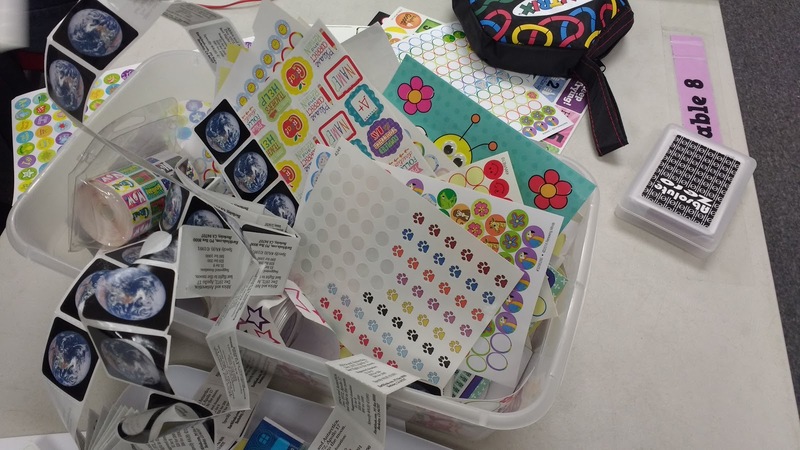 When you pull out stickers, the complaining goes away! 4. Have a few extra odd minutes at the end of class? Try an online game of Think Fun's Rush Hour. 5. 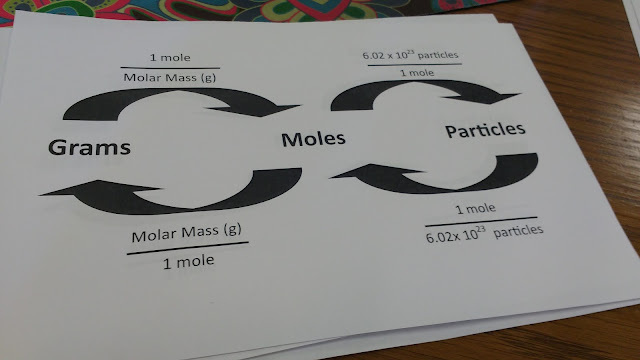 My chemistry students have really taken to using our mole map as a tool for conversion problems. If I was only a science teacher (instead of a math teacher who teaches one hour of science each day), I would definitely have a giant version of this on the wall!